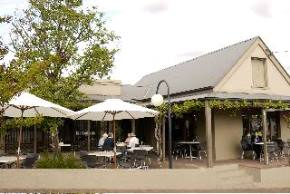 Located amidst a group of shops, this quaint courtyard brasserie is an upmarket cafe tucked in just around the corner from the main street of Cowra. All of the food is prepared to order, meaning that many meals can be made gluten free! Where possible, local produce is used. All of the dressings, chutneys and relishes are gluten free. As well, all meats and steaks for the various dishes are freshly cooked at the cafe, and they are all gluten free. Cooked breakfasts are available, including gluten free toast cooked in a dedicated toaster. There are plenty of lunch options, and gluten free bread is available for sandwiches. Fancy a coffee with something sweet? There's usually at least 4-5 gluten free cakes, and they can be enjoyed with a cup of Bill's Beans coffee (freshly roasted beans from Orange). Customers can dine indoors, with air conditioning to provide comfort. There's also a cosy, grapevine adorned courtyard for outdoor dining. The cafe has a relaxed comfortable atmosphere, with friendly table service. Split bills are permitted and BYO alcohol is allowed. A catering service is also available, with numerous gluten free options.